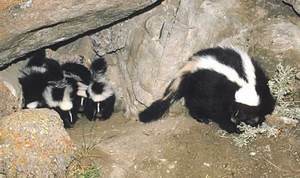 The most recognizable smell for most people is the smell of skunk odor. This is why they can be very difficult for most people to trap because how do you remove it from the trap. We are able to solve any skunk problems and help prevent them from happening again. The most common areas that skunks will be on your property is under a deck, under a shed, or in your crawl space. Skunks can become a risk when they are living on your property because if scared they will spray. If you have a dog there is a very good chance that it could get sprayed and that smell is very hard to get rid of. We are able to deodorize houses or under house after a skunk has sprayed.